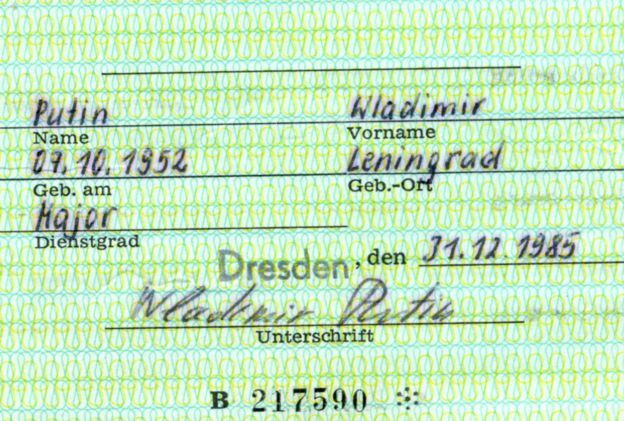 A Stasi ID pass used by Vladimir Putin when he was a Soviet spy in former East Germany has been found in the Stasi secret police archive in Dresden. The Russian president has expressed pride in his record as a communist KGB officer in Dresden in the 1980s. His Stasi pass was found during research into the close co-operation between the KGB and Stasi. Mr Putin, then a KGB major, got it in 1985. It got him into Stasi facilities, but he may not have spied for them. 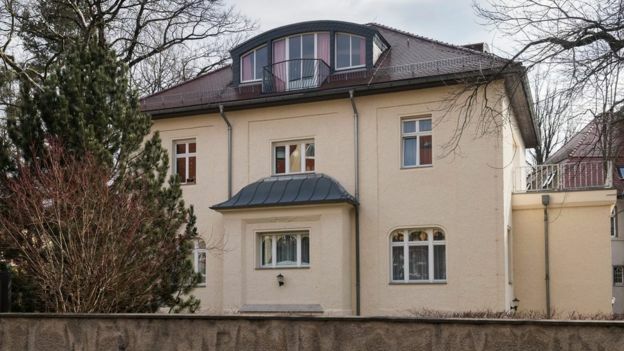 In a statement on Tuesday, the Stasi Records Agency (BStU) said that Mr Putin “received the pass so that he could carry out his KGB work in co-operation with the Stasi”. Stasi was actually the nickname for East German Ministry of State Security (MfS) agents. It was notorious for its meticulous surveillance of ordinary citizens, many of whom were pressed into spying on each other. “Current research gives no indication that Vladimir Putin worked for the MfS,” the BStU statement said. Mr Putin, born in Leningrad (now St Petersburg), was posted to East Germany in 1985, aged 33. His two daughters were born during that posting. He is now 66. Mr Putin was a KGB officer in Dresden up to and including December 1989, when the communist East German regime collapsed amid mass pro-democracy protests. 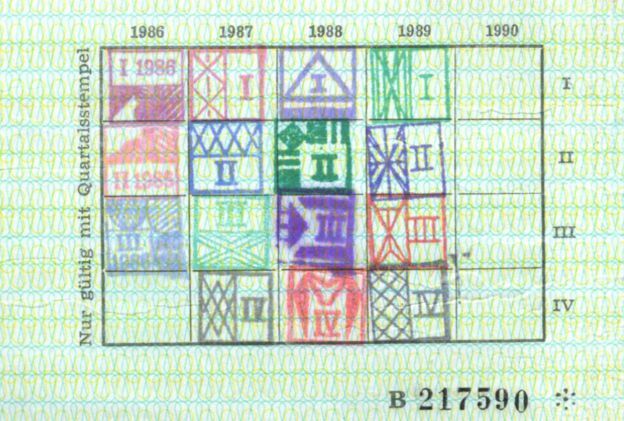 His Stasi pass was renewed every three months, as shown by the stamps on it. It is not clear why he left the pass in the Stasi files in Dresden. He witnessed protesters occupying the Dresden Stasi headquarters, while communist security forces came close to opening fire on them, on 5 December 1989. Jubilant East Berliners had already breached the Berlin Wall in November. Mr Putin was fluent in German at the time and has said he personally calmed the Dresden crowd when they surrounded the KGB building there, warning them that it was Soviet territory. During his KGB service in Dresden Mr Putin was promoted to the rank of lieutenant colonel. In 1989 he was awarded a bronze medal by communist East Germany – officially the German Democratic Republic (GDR) – “for faithful service to the National People’s Army”, the Kremlin website says. After returning to Russia, Mr Putin rose to become head of the Federal Security Service (FSB) – main successor to the KGB. He became Russian president in 2000. In June 2017 Mr Putin revealed that his work in the KGB had involved “illegal intelligence-gathering”. Speaking on Russian state TV, he said KGB spies were people with “special qualities, special convictions and a special type of character”. A once top secret agreement between the KGB and Stasi, seen by the BBC, shows that the KGB had 30 liaison officers in East Germany who worked directly alongside the Stasi. Kremlin spokesman Dmitry Peskov shrugged off the emergence of Mr Putin’s old Stasi card. “The KGB and the Stasi were partner intelligence agencies so you probably can’t rule out an exchange of such identity cards,” he said.